Summary: FRANK SINATRA FAWNED OVER HIM. WARREN ZEVON WROTE A TRIBUTE SONG. Sylvester Stallone produced his life story as a movie of the week. In the 1980s, Ray “Boom Boom” Mancini wasn’t merely the lightweight champ. An adoring public considered him a national hero, the real Rocky. But it all came apart November 13, 1982, in a brutal battle at Caesars Palace in Las Vegas. Mancini’s obscure Korean challenger, Duk Koo Kim, went down in the 14th round and never regained consciousness. Three months later, Kim’s despondent mother took her own life. The deaths would haunt Ray and ruin his carefully crafted image, suddenly transforming boxing’s All-American Boy into a pariah. Now, thirty years after that nationally televised bout, Mark Kriegel finally uncovers the story’s full dimensions. In tracking the Mancini and Kim families across generations, Kriegel exacts confessions and excavates mysteries—from the killing of Mancini’s brother to the fate of Kim’s son. In scenes both brutal and tender, the narrative moves from Youngstown to New York, Vegas to Seoul, Reno to Hollywood, where the inevitably romantic idea of a fighter comes up against reality. I actually spotted THE GOOD SON: THE LIFE OF RAY "BOOM BOOM " MANCINI by Mark Kriegel in a discard pile in the shipping room at this year's BEA. I immediately grabbed it because I knew that either my dad or I would want to read this book. As a child, I have vivid memories of watching Mancini with my father, and I considered him one of my favorite boxers. I even recall being devastated from the tragedy that took Duk Koo Kim's life. 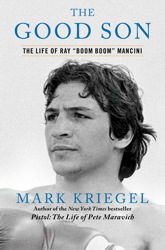 I’ve always enjoyed reading a good book about sports and THE GOOD SON, THE LIFE OF “BOOM BOOM” MANCINI by Mark Kriegel didn’t disappoint. It’s a story about the life of a good kid from an economically depressed town who wants to win a boxing championship for his father. Ray Mancini was born in Youngstown, Ohio, a depressed rust belt town run by the mob. Ray’s father, Lenny “Boom Boom” Mancini was a boxer who lost his opportunity for a title fight when he was seriously wounded in World War II. Ray, a good student and outstanding athlete, assumed his father’s nickname “Boom Boom” and entered the corrupt world of professional boxing in 1979 at age 18. Three years later he became the World Boxing Association lightweight champion of the world. Mancini not only was a hero in his home town but became a favorite throughout the country. Because of his background, popularity and his fighting style, he was seen as the savior of boxing. He made the cover of Sports Illustrated, was friends with movie stars, had a tribute song written about him and had a movie produced about his life. The dream came crashing down on November 13, 1982 in a brutal title defense against Korean contender, Duk Koo Kim. Kim was knocked unconscious in the fourteenth round and died a few days later. The death haunted Mancini the rest of his career, tarnished his image and changed boxing forever. In 1984 he lost the WBA title and at the age of 24 retired from boxing. No longer an American hero, Mancini’s life now followed the story line of so many other defeated boxers – failed comeback attempts, a failed marriage, Hollywood dreams and a constant search for the lost adulation. THE GOOD SON is more than a book about boxing. Author Mark Kriegel gives the reader a detailed picture of the environment Mancini grew up in, tells about the corrupt side of boxing and shares stories about the family lives of Mancini and Kim that make them very real people to the reader. Kriegel also does an excellent job of describing the action before, during and after the fights, but the strength of his book is in telling the father-son story. THE GOOD SON is an excellent book for sports fans but would also be of interest to anyone who enjoys a good story about a father-son relationship. Thank to Booking Pap Pap for his review of THE GOOD SON. I received a copy of this book at the 2012 BEA. Mr. BFR and I are boxing fans and based on that, I know I'd like to give this book a try. But the fact that it is also a good father-son story really increases my interest. Good find in mail room! I had no idea you have favorite boxers! I don't like boxing, but I do like biographies and this sounds like a good one. I haven't heard of this boxer before, but it sounds like he has had quite a life of drama and sadness.